Fried chicken is one of my weaknesses. Not only was KFC one of the few fast foods we were allowed to have as kids, but also, even the week before my mother died, just the mention that there was a piece of KFC in the house brought happiness to her eyes. 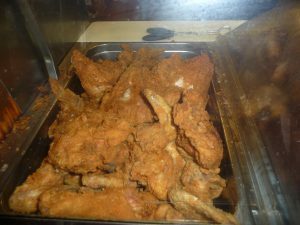 So this summer, on our trip to Tennessee, I was determined to find the best fried chicken I could find. (Well, within reason. I mean even I can’t stomach fried chicken every day). In Nashville I ate fried chicken at Rotiers Restaurant. It wasn’t nearly as good as the hash brown casserole, which was a revelation to me. (Readers, expect my own recipe soon, after I get done experimenting.) 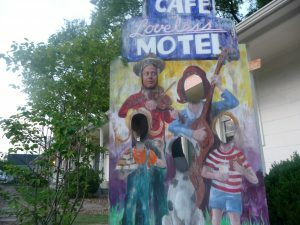 I asked my Facebook friends where to eat, and they unanimously recommended the Loveless Café, where I had the best biscuits in Nashville by far; but the fried chicken still wasn’t as good as mine. 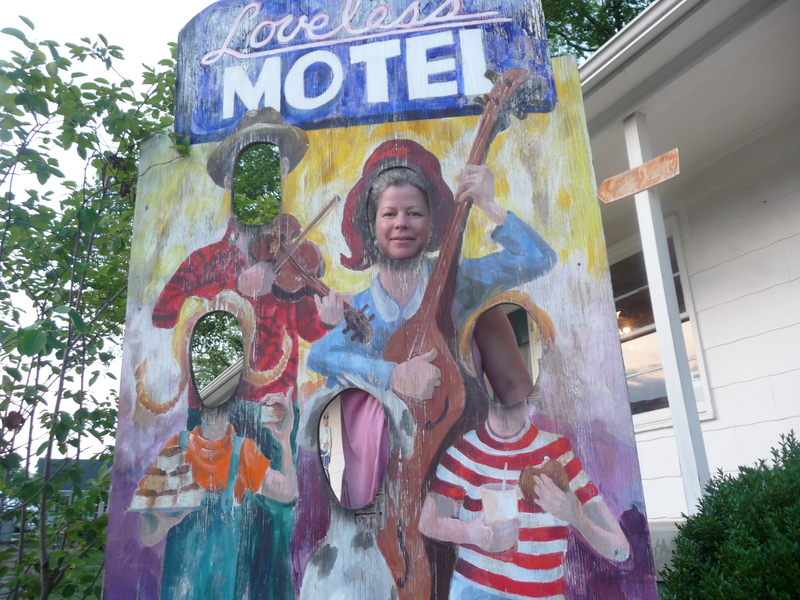 Then, when we got to Blackberry Farm in Walland, Tennessee, my hopes rose. We ordered a picnic of fried chicken in a pavilion by a pond and a stream. The concierge said it was brined for three whole days. But hopes were dashed: It wasn’t that great. Although we ate every last piece. 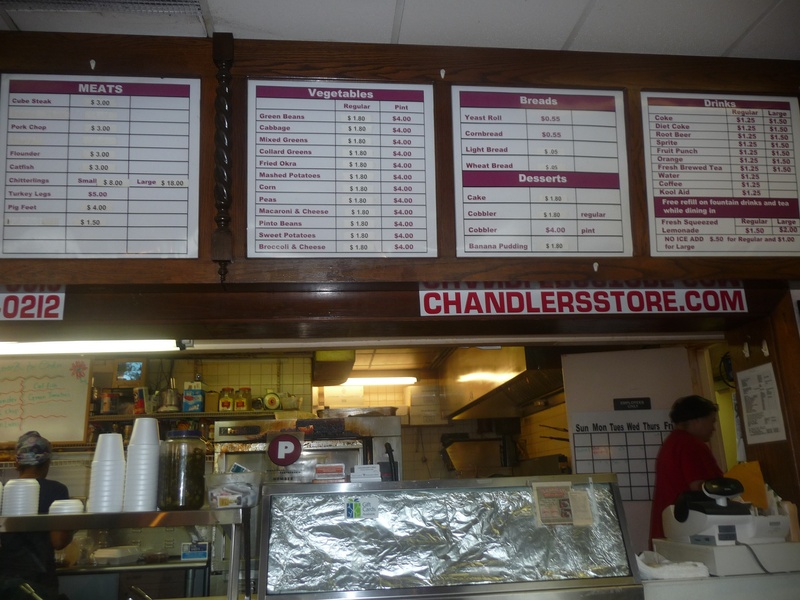 And so for our last meal in Tennessee on our way home, we stopped at Chandler’s. 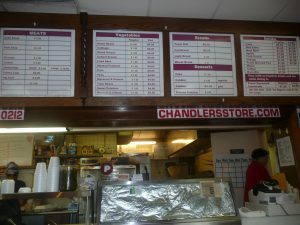 Let’s just say, while it was slightly different than my fried chicken, Chandler’s was amazing! Totally crispy, greasy, batter-y goodness. One thigh was enough to satisfy all my hunger and it was good. Very good. As you can see from the pictures, Chandlers is a total dive. But if you are in or near Knoxville, it’s worth the visit. Check back for my easy fried chicken recipe! You have to wait for the great food at the Loveless. Fortunately, there is lots to do. If you are ever in central Florida,right ouside of O rlando is a smll town called Pinecastle,and in this small town is a greasy spoon called…wait, ok OLD DIXIE FRIED CHICKEN,the best anywhere. I highly recommend it. My son took his first steps in an effort to get at my husbands incredible fried chicken! Really. I’m not kidding. Frankly, if you Kentucky Fried Chicken eaters of yesteryear really remember how it tasted, you will understand when I say that the Kentucky Fried Chicken of today’s fame isn’t worth the batter that goes on it! None of the seasonings that made this chicken exceptionally good in the 50’s, 60’s and even the early 70’s, are used. The chicken is ordinary at best, and totally tasteless at worst. For those of you who know, I’m sure that you would agree. 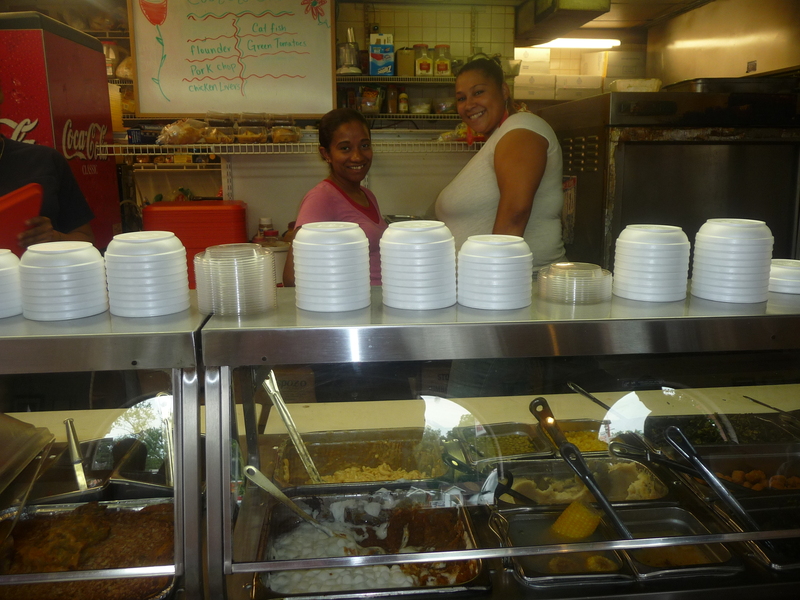 The coleslaw and strawberry pies that they use to sell was also fingerlickin’ good. Don’t waste your money, fry up your own. I’m sure it will taste better. The “COLONEL” took the secret ingredients to his grave. May he rest in peace. Publix Supermarket at the corner of Bonita Beach Road and US 41 in Bonita Springs, FL ( I mention this store specifically because I have tried the fried chicken at the other Publix’s and it does NOT taste the same) have some of the tastiest fried chicken I have had in a long time, outside of the family (at least they did when I lived there a few years back). It was crisp, seasoned well and fried up well. I always tried to get it when it just came out of the oil. It was NEVER dry or too greasy. Yum-my! 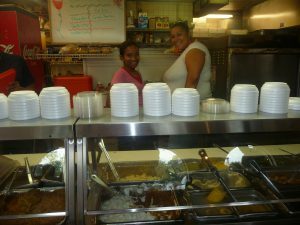 I love fried chicken < if anyone comes to St. Louis Missouri, We have a place called Hodaks been in exsistance since before i was around. There slogan is where chickens come to roost! I enjoy your blog keep up the good work. You actually make it seem really easy with your presentation however I in finding this matter to be actually something that I feel I’d by no means understand. It sort of feels too complicated and extremely vast for me. I am looking forward to your subsequent publish, I’ll try to get the grasp of it! The best fried chicken I’ve ever had is Mr. D’s at the Old Country Store in Lorman, Mississippi. I always loved KFC. 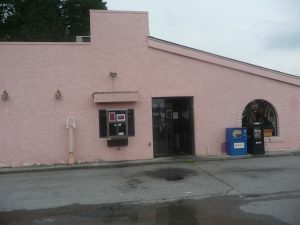 I think the very best fried chicken I ever had though was at some motel restaurant down in South Carolina. Savannah, GA I think had some great fried chicken too. The best fried chicken in the USA is at the Gondola in Crossville Tn. No one else even comes close.